A) Cleveland will not get a nonstop flight to continental Europe. B) Cleveland will get no regularly scheduled wide-body passenger service to anywhere. 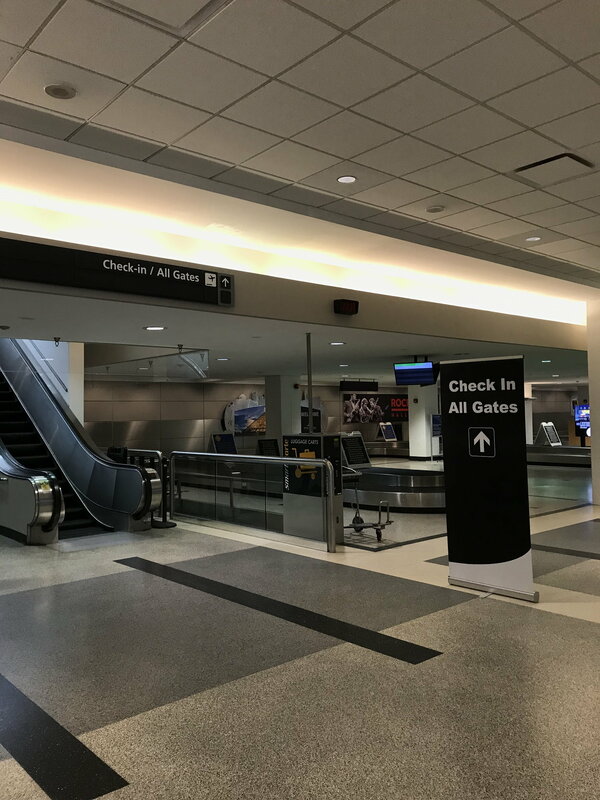 C) While other U.S. cities sink billions into airport improvements Cleveland Hopkins will tout its accomplishment in attracting eateries like Shake Shack to its airport. D) The Plain Dealer's Susan Glaser will wax euphoric in a major article on the culinary delights of the new airport eateries in our airport that time forgot. E) Strange paranormal activities are reported in permanently mothballed Concourse D, including the ghosts of Amelia Earhart, Orville and Wilbur Wright. F) Airport Director Robert Kennedy dashes from his office screaming "you can take this job and shove-it" when confronted with another I-Team investigation, this time of mysterious simultaneous escalator and elevator breakdowns. 1. DL or AS adds CLE-SEA. 3. No TATL to Europe is announced--arising from incompetent air development staff that have been there since Ricky Smith. 4. The taxi/uber/lyft issue gets worse with the latest "improvements"
5. Airport Director Kennedy does not finish out the year. 6. The economy slows a bit and pax levels continue to grow, but by only 100k or 200k. 7. FI does well on CLE-KEF. I think that F9 is unlikely to add CLE-SJC nonstop service since F9 has already dropped CVG-SJC nonstop service and since F9 has already announced the return of CVG-SFO nonstop service in 2019. I agree that NK might add a new route out of CLE in 2019, and NK could add CLE-IAH nonstop service since (a) Houston is the 2nd largest market (after NYC) that isn't currently served nonstop from CLE on a LCC or ULCC, (b) NK was able to make CLE-ATL and CLE-DFW nonstop service work, whereas F9 dropped CLE-ATL and CLE-DFW nonstop service, and (c) IAH is one of the largest NK stations that NK doesn't currently serve nonstop from CLE. I think that WN adding CLE-HOU nonstop service might actually happen in 2019 since (a) WN is still expanding domestically at HOU, (b) WN has added new nonstop routes out of HOU during the last 2 years, and (c) WN had previously said last year that it was considering adding CLE-HOU nonstop service. 1. DL or AS adds CLE-SEA.-Pretty good prediction; I'll vote for AS. 3. No TATL to Europe is announced--arising from incompetent air development staff that have been there since Ricky Smith.-Agreed; it's likely too late for summer 2019. I don't believe it's for lack of trying or incompetence from the air development staff; it's simple economics and demographics. 4. The taxi/uber/lyft issue gets worse with the latest "improvements"-Probably true. The situation will likely come to a head in 2019, with more changes on the horizon. 5. Airport Director Kennedy does not finish out the year.-Not at all sure about this. Remember, it's not the person, it's the airport governance structure that's the root cause. 6. The economy slows a bit and pax levels continue to grow, but by only 100k or 200k.-Very likely; although I'm hopeful CLE breaks 10 million pax in 2019! 7. FI does well on CLE-KEF.-Agreed; and possibly operates year-round. ^CLEguy, regarding #5 above, governmental structure its not the root cause. Kennedy is single-handedly making Hopkins into a landside circus. He has 60% of the departure level chopped off for valet, is removing MORE parking for taxis that is in a location beyond that of every major airport in the US that is larger than it, and Uber/Lyft pax cannot get dropped off where they want to, and are picked up in a distant location? Regardless of the airport being city controlled, privately-run, or otherwise, these decisions do not have to be made this way and if run by a private corporation, the same bad decisions could be made. This is---surprisingly--Kennedy. I think he wants to be fired--and this action will get the community in an uproar. 5. Given Kennedy's age, I think he will stay as long as he can -just my opinion. 6. I think the CLE numbers will grow by at least double that, growing to 10+ million - always assuming your economic forecast is correct. There is strong evidence (see NOTE) that the area will show some population growth - the city still might not, but the region will be positive and the city will come very close. The new population will tend to be salaried and more likely to fly for business and pleasure than the average person in the region. 7. WW will apparently be down from 20 planes last summer to 11 for the coming summer. As a result, FI in CLE is looking more and more like the only Icelander anywhere nearby - PIT is probably gone and DTW looks iffy. CLE-KEF was drawing from as far as Dayton last summer even with CVG in the mix. So, I agree FI in CLE will have a very good year. NOTE:The November non-farm jobs numbers for the Cleveland MSA are the best since 2001 - there are more people working than are available in the workforce, meaning workers are commuting from outside the area. And this number inversion has been happening repetedly throughout the year. Eventually this leads to more local residents. I do worry about the Lordstown likely closure. All the downstream jobs…not yet reflected in any numbers. It’s probably nothing more than entertainment value but Cleveland.com article up to over 200 comments on the new roadway set up. Overwhemingly negative, a few positive, a few very juvenile as one might expect. I respectfully disagree. Kennedy is hamstrung by a very entrenched, very backward thinking governmental bureaucracy that does not have a clue on how to run a mid-sized international airport effectively. Even if Kennedy wanted to make significant positive changes, he would be restrained by city leadership who are at best, indifferent to customer-friendly airport management, or at worst, incompetent and solely looking out for special interests. If there were an independent board governing Hopkins, they could offer a check on these questionable decisions that have caused such an uproar. At the risk of being unpopular or ridiculed, the ground transportation situation at CLE is certainly not ideal. However, it is not as horrible as many commentators (particularly on cleveland.com) have made it out to be. Yes, it's more inconvenient, but compared to many other airports, the distances and inconvenience involved are relatively minor. Due to these recent changes, I would never, ever consider flying from CAK, PIT or DTW. I'm 20 minutes from CLE and will adjust how I get to my local airport accordingly, if necessary. 1. FI goes year round. WW out in Cle and Pit helps. 2. SEA won’t happen on DL too committed to SLC. AS maybe. 5. WN add Saturday service to SJU replacing the former UA service. 7. AC adds YUL finally. UA won't cut CLE-LGA until it figures out what to do with the LGA slots associated with the route. At the moment, UA probably has no need to add more capacity and frequency to IAH, ORD, or DEN from LGA (or IAD) so unless it decides to sell those slots, which under Kirby I just do not see happening (Smisek would have done it), UA will continue to fly LGA-CLE-LGA for the foreseeable future. UA would be foolish to give up CLE-LGA, connecting a 4-5MM city with a [still] loyal UA following and the nation's biggest business center, where there are many UA loyalists as well (from the hub at EWR). UA was foolish to give up Boston but they did it. Granted BOS is not NY, but it's still a damn important business center, and not one where UA has a competing hub. Delta didn't hesitate to jump in, and Delta hasn't hesitated to put much better equipment on the LGA route. On fun2fly's prediction of concourse D, it would be nice if that was dealt with once and for all (as an aside I just finished reading a very good new fiction book called Lake Success by Shteyngart, and unbeknownst to me ahead of time, they had a scene at Cleveland airport, and made a big point of describing empty concourse D as a metaphor for declining Cleveland. . . . .). But here's my question: Continental/UA built a building that is now obsolete for CLE-- when the time comes (probably after the master plan if I had to guess, not in 2019), who will be responsible for the massive cost of either demolishing and repurposing the land, or else reconfiguring the terminal? It's probably CLE but one can hope it would be UA. United Air Lines had nothing to do with the construction of Concourse D. It was all Continental Airlines and the City of Cleveland when CO decided to go all RJ for Continental Express at CLE and end turboprop flying there in the late 1990s. The airport could use the dormant D concourse as a temporary structure while it remodels A and B. Its also not necessarily obsolete. It could be modified to accommodate larger planes even if only one side. No real need to tear it down as long as the structure is being maintained during vacancy. It was designed to be "easily" converted to handle 737/A320 equipment. On the jet side, notice that there are 2 biggest side by side ad each gate. Just remove every other jetway and that side is a 6 gate narrow body terminal. The prop side is harder, but same could be done by demolishing the ground level structures. United had nothing to do with the construction of D that’s pretty obvious point, but they assume outstanding contractual obligations from Continental in a merger. I doubt anyone on this board really knows what’s in that contract but there’s a good chance Cleveland faces a pretty big bill to make it usable again, even if for future AB or C concourse remodeling relief. Probably as written in the current lease agreement, but there is nothing preventing both parties from amending the agreement should the need arise, I’m sure UAL would be open to letting the city or another party use D in trade for a fee, change in lease terms or perhaps a lease extension. Bottom line is UAL is already paying for it, I don’t see any reason why they would want to stick it to the city and not try to recoup some of the cost of the construction debt. I don't think UA cares enough about CLE to do that. ^In general, I would have thought so too, but with UA, you never know.... In any event, as soon as UA's term is up or another arrangement is made, Concourse D can be transformed to handle larger aircraft. Its already far more modern than A, B, or C---and probably still will be when the UA lease is up, given the lack of attention to the existing used concourses. And upgrading D will certainly be cheaper than constructing a new structure. UA was foolish to give up Boston but they did it. Not quite sure what UA was thinking. It took DL literally about 10 seconds to jump into CLE-BOS. Did UA folks really think the service would not be replaced by another carrier? Meanwhile UA will be using the aircraft on thin stuff like ORD-EUG. Good luck with that. I guess serving existing hubs at any cost is the vision of UA now. Definitely a win for DL over UA. The CLE-BOS DL response does make me wonder if UA will be a bit more cautious in regards to CLE-LGA and CLE-DCA. The CLE-BOS situation does make me wonder if UA will be a bit more cautious in regards to CLE-LGA and CLE-DCA. One big difference between BOS, LGA, and DCA is that LGA is located in the same market as UA's EWR hub and DCA is located in the same market as UA's IAD hub, whereas UA doesn't have any hubs in the New England region. Another big difference is that BOS doesn't have slot restrictions whereas LGA and DCA are slot-restricted airports. 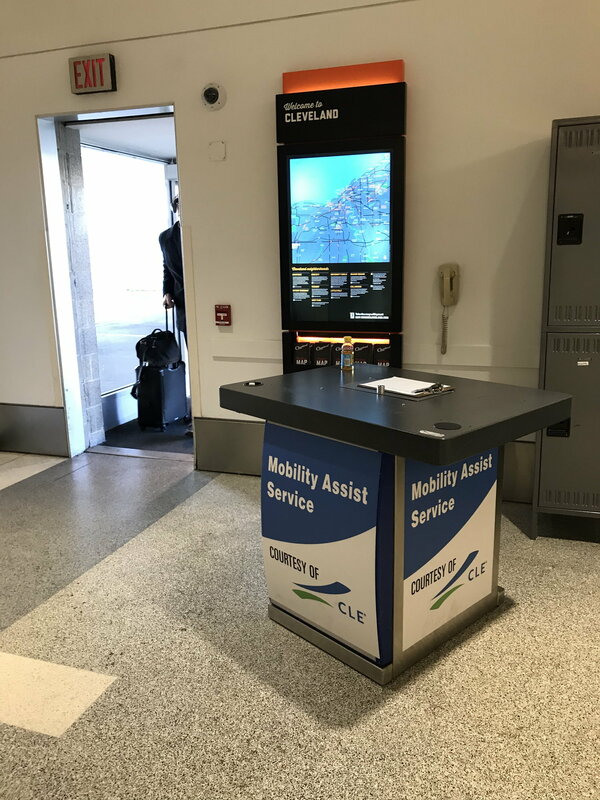 UA has a significant FF base in the NYC and DC markets to support CLE-LGA and CLE-DCA nonstop service, and there are some UA frequent flyers in the NYC and DC markets who fly to CLE from LGA or DCA. On the other hand, most of the business travelers in Greater Boston prefer to fly on DL or B6 instead of UA. So much for arriving at BKL 10 minutes before departure time for Ultimate Air.... New procedure announced today, though still easier boarding than at Hopkins. "Ultimate Air Shuttle will begin a new boarding procedure effective immediately to better serve our customers. In an effort to maintain on time performance, aircraft doors will close 10 minutes before your scheduled departure. This change will allow the flight teams extra time for engine start and taxi, to ensure an on time departure. Please arrive at the Ultimate Air Shuttle facilities 15-30 minutes before your scheduled departure." I had my first chance to see the new ground transportation system in action today and it seemed to be working rather well. 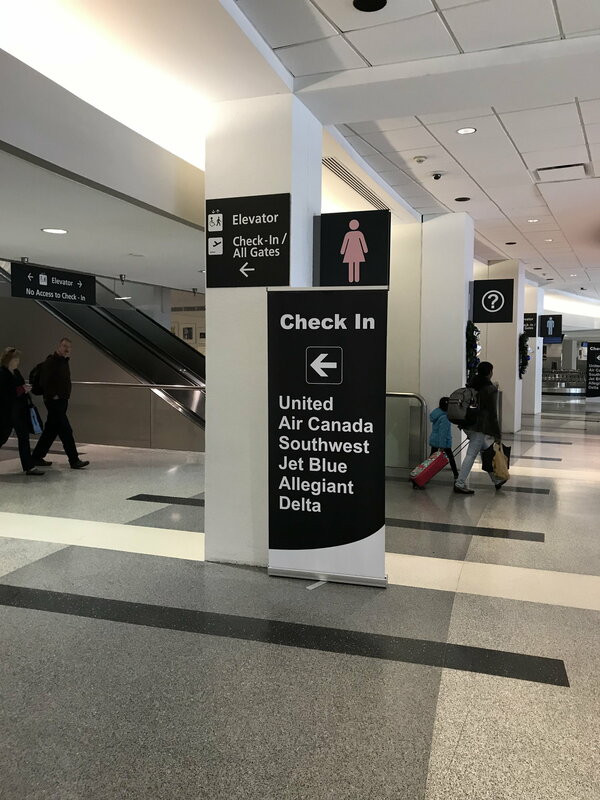 There are a host of new signs/banners throughout baggage claim directing passengers to check-in from the new drop-off point (former taxi stand), some of which were better than others. There are also personnel stationed at the drop-off point to assist with directions and persons needing wheelchairs. 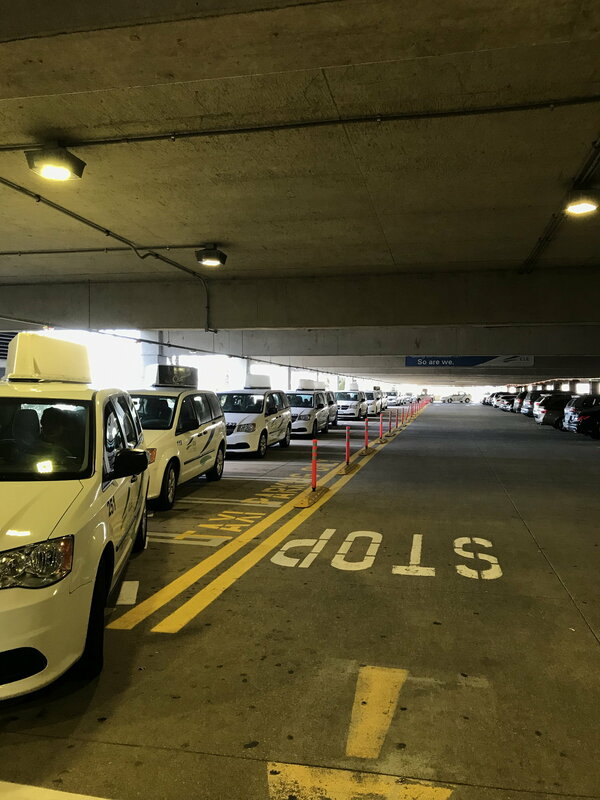 There was a long line of taxis in the garage waiting, but the staff at the ground transportation center said that while they have received a few complaints in the last six days, it has not been too bad. I assume some Uber/Lyft drivers will try to cheat the new drop-off system at the risk of being fined. Rumor is there may be some Frontier announcments this week. Supposedly Frontier is having a press confrence at CLE. Anyone know anything about it? I think that the most likely adds by F9 out of CLE include (a) the return of CLE-MIA or CLE-FLL nonstop service, (b) the return of CLE-SFO nonstop service, and (c) the addition of CLE-JAX nonstop service. I think that NK adding CLE-IAH nonstop service or WN adding CLE-HOU nonstop service is more likely to happen than F9 bringing back CLE-IAH nonstop service. F9 is unlikely to bring back CLE-DFW nonstop service since F9 hasn't brought back CLE-DFW nonstop service since dropping it almost 4 years ago. The start date for DL service to BOS has been moved up to March 3. Interesting. When does UA service end? Also, when is the F9 press conference? DL begins March 3, UA ends March 7. Is there an F9 presser this morning? Nextant Aviation, in its usual quiet way, announced type certification of the Nextant 604XT and is offering it for sale. Rebuilding Bombardier's Challenger biz aircraft at Cuyahoga County Airport gives the company three models. Actually Nextant does issue regular press releases to the business/general aircraft media; they just stay out of the general press. Could the F9 news simply be the inaugural flight to Punta Cana this morning? It looks like the DOWN escalator in the center of the terminal from ticketing to the lower level is out of service. I've heard it will take 3 weeks to repair! Anyone know the details of the PUJ flight ? and will Sunwing still operate there flts? Thanks! If I remember right PUJ was a 763 ! Also I wonder if MBJ or FPO will return late spring! Horrible, difficult-to-look at photo. Why would CLE post a photo like that? Some type of jab at the new eatery over some tiff? ^or just shoddy, who-gives-a-crap work? Its cool to take photos like that now...On a slant.. Exactly. Occam's razor applies here. These types of altered perspective photos are all over Instagram these days, whether an old curmudgeon like me likes it or not. I'm more interested in whether or not this place is any good. Won't be at CLE until next week- has anybody tried Embers? Worth a stop?